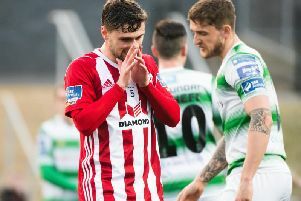 Derry City had to battle hard for a share of the spoils against Shamrock Rovers, on Friday night. It was an off night for the Candy Stripes who were second best for long periods against an impressive Rovers. Kenny Shiels' side had a few half chances, but they had keeper Gerard Doherty to thank for a point, as he denied Rovers striker Danny Carr twice, while the woodwork also came to City's rescue twice when Carr and Graham Burke hit the crossbar and post respectively. City returned to action on Monday night when they secured a hard fought 3-0 win at Limerick, with Patterson and Aaron McEneff (2) their goalscorers.